Gujarat, a state with world-wide fame for tourism is blessed with rich wildlife, stretches of deserts, magnificent palaces, numerous water resources, and many heritage places, have got a new feather in its cap. Film makers across India are eyeing at this state of west India to shoot movies of different genres. Not only the movies of the recent time but few Bollywood movies of yesteryears have also been shot in Gujarat. Read this document to know more about Shooting in Gujarat. There are many reasons that have made Gujarat one of the most happening shooting destinations for the film makers across India. The places Vadodara and Ahmedabad in Gujarat are very well connected to Mumbai, Gujarat houses many heritage hotels and heritage places, infrastructure improvement over the years, reasonably priced accommodations, encouragement by the government by setting up new policies and many unexplored areas in Gujarat which are picture perfect. Recently many movies from Bollywood and other film industries are getting shot in various parts of Gujarat but few movies of yesteryears have also been shot in Gujarat State. ‘Mother India’ (1957), a movie starring “Nargis”, “Rajendra Kumar”, “Sunil Dutt”, “Raj Kumar” was shot in Gujarat. ‘Guide’ (1965), a movie directed by “Vijay Anan” starring “Dev Anand”, “Leela Chitnis” and “Waheeda Rehman” had many scenes shot in Gujarat. “Ketan Mehta”, a popular director of Bollywood, had many scenes of his movies shot in Gujarat. ‘Mirch Masala’ (1987), a movie starring “Smita Patil”, “Naseeruddin Shah”, “Deepti Naval”, “Om Puri” and others has been shot in Gujarat. "Sardar" (1993) movie based on the life of “Sardar Vallabhbhai Patel”, directed by the famous director “Ketan Mehta” has been shot in different parts of Gujarat. The movie stars “Paresh Rawal”, “Annu Kapoor”, “Benjamin Gilani” and “Tom Alter”. ‘Hum Dil De Chuke Sanam’ (1999), popular hit movie directed by “Sanjay Leela Banshali” starring “Aishwarya Rai Bachchan”, “Salman Khan” and “Ajay Devgan” was also shot in Gujarat. ‘Sooryavansham’ (1999), a Hindi Movie starring “Amitabh Bachchan”, “Anupam Kher”, “Kader Khan”, “Jayasudha”, “Rachna Banerjee”, “Mukesh Rishi” has been shot in Gujarat. “J P Dutta” movie ‘Refugee’ (2000), the debut movie for “Kareena Kapoor” and “Abhishek Bachchan” was shot in the Great Rann of Kutch, the India-Pakistan Border. ‘Laagan’ (2001), a trend setting Bollywood movie directed by “Ashutosh Gowariker” was shot in Bhuj, a popular city of Kutch District. As per the requirement of the movie, the rocky surroundings and the barren lands have been beautifully portrayed in the movie. The movie won several prizes and was even nominated for Oscar Award. The movie had “Aamir Khan”, “Gracy Singh”, “Suhasini Mule” and a number of popular actors and actresses. ‘Rang Rasiya’ (2007), a Hindi Movie directed by “Ketan Mehta”, is based on the life of famous Painter and King “Raja Ravi Verma”. The movie has scenes shot at Laxmi Vilas Palace located at Vadodara. The movie stars “Nandana Sen” and “Randeep Hooda” as “Sugandha” and “Raja Ravi Verma” respectively. ‘Gandhi – My Father’ (2007), a movie based on the relationship of Gandhiji and his eldest son, Harilal was shot in various places of Ahmadabad city of Gujarat. The movie has “Akshay Khanna”, "Shefali Shetty”, and “Darshan Jariwala” playing the roles of Harilal, Kasturba and Gandhiji. ‘Grand Masti’ (2013), a movie starring “Ritesh Deshmukh”, “Aftab Shivdasani”, “Vivek Oberoi” and others were also shot at Vadodara in Laxmi Vilas Palace. The title song of ‘Grand Masti’ has been shot in the Durbar Hall of this palace. ‘Kai Po Che’ (2013), the Hindi Movie based on the novel “Three Mistakes of My Life”, written by “Chetan Bhagat”, has many of its scenes shot in Ahmadabad and Vadnagar. ‘Rambo Rajkumar’(2013), which got released with the name ‘R..Rajkumar’, is a Hindi Movie starring “Shahid Kapoor”, “Sonakshi Sinha” and “Prabhu Deva” have scenes shot in Little Rann of Kutch, Rajkot and Gondal areas of Gujarat. A song sequence of ‘Rambo Rajkumar’ was shot with the backdrop of white desert of Little Rann of Kutch. ‘Goliyon ki Raasleela:Ram Leela’ (2013) , a blockbuster Hindi Movie by popular director “Sanjay Leela Bansali”, starring “Deepika Padukone” and “Ranveer Singh” has been shot in Gujarat in the places like Rajkot and Bhuj. ‘Matru Ki Bijli ka Mandola’ ( 2013), starring “Anushka Sharma”, “Imran Khan”, “Pankaj Kapoor”, “Shabana Azmi” were shot in Wankaner Palace of Gujarat. The movie is directed by “Vishal Bhardwaj”. Director “Nikhil Advani’s” movie ‘D-day’ (2013) starring “Irfan”, “Rishi Kapor”, "Arjun Rampal” and others was also shot in Rann of Kutch in Gujarat. The Hindi Movie ‘Boss’ (2013) directed by “Anthony D’Souza” starring “Akshay Kumar”, “Sonakshi Sinha”, “Mithun Chakraborty”, “Ronit Roy” and others had scenes shot in Little Rann of Kutch. “Ajay Devgan” and “Kareena Kapoor” starrer ‘Singham Returns’ (2014) has scenes shot in Pavagadh, a place near Vadodara. Rohit Shetty is the director of this movie. The shooting was done at Vadodara-Halol Highway. Director “Satish Kaushik” has his ghost-comedy movie ‘Gang of Ghosts’ (2014) shot at a haunted haveli, Dumas Haveli in Gujarat. The movie stars “Anupam Kher”, “Meera Chopra”,"Vijay Verma”, “Saurabh Shuukla”, “Mahie Gill”,"Jackie Shroff”, "Chunky Pandey” and others. Another “Ashutosh Gowariker” movie, ‘Mohenjo Daro’, scheduled to hit the screen in January 2016 will be shot in various parts of Gujarat State. This movie has “Hrithik Roshan” in the lead role. Director “Tigmanshu Dhulia’s” upcoming movie the sequel of ‘Sahib, Biwi Aur Gangster’ is getting shot at Devgadh Baria. One of the most talked about movie of the recent time, ‘Piku’, directed by “Soojit Sarkar”, has many scenes shot in Ahmadabad. The movie stars “Amitabh Bachchan”, “Irfan Khan” and “Deepika Padukone”. Other movies shot in Gujarat are ‘Krish 3’ (2013) starring "Hrithik Roshan", “Priyana Chopra”, “Kangana Ranawat”, “Vivek Oberoi”, “Arif Zakaria” and others , “Arabaz Khan’s” movie ‘Dabangg 2’ (2012) starring “Salman Khan” and “Sonakshi Sinha”. ‘Ghayal Returns’ (scheduled release in 2015), a sequel of famous Hindi movie ‘Ghayal’, starring “Sunny Deol” and “Bipasha Basu”, is shot in Gujarat. The most preferred shooting destinations of Gujarat are Ahmedabad, Gondal, Rajpipla, Bhuj, Devgadh Baria, Little Rann of Kutch, Great Rann of Kutch, Mandvi, Saputara, Dahod, Junagadh Maqbara, Polo Forest. Find here details of some important shooting places in Gujarat. This majestic palace is located at Mandvi and was constructed in the year 1929. It was built by Vijay Raj Ji. The palace has got architecture influenced Rajput Style and is made of Red Sandstone. The palace has huge domes, colored glass windows and lush green surrounding. Movies shot here are ‘Lagaan’ and ‘Hum Dil De Chuke Sanam’. Not only movies but Gondal is a favorite shooting place for many television serials and fashion shoots. Gondal used to be capital of Jadeja Kings; the rulers of Gujarat and later on came under the control of the Mughals. The places where shooting takes place in Gondal are Naulakha Palace, a palace built in 18th Century AD, Old Palace Complex or Darbargadh and the Riverside Palace built in 1875 by King Bhagwat Singhji. The vintage look of Huzoor Palace or the Oxford Palace of Gondal is another favorite shooting place. The Orchard Palace, a palace transformed into a heritage hotel can be seen in many movies that are shot here. One such is the movie ‘Hum Dil De Chuke Sanam’. The palace has classic interiors and has a huge of vintage cars some of which date back to the period of World War II. Many scenes of Hindi Movie ‘Hum Dil De Chuke Sanam’ were shot at the Orchard Palace, Gondal. Wadhwan is located in the Sundernagar District of Gujarat and is famous among the film makers for its beautiful Rajmahal Palace that was built by H.H. Bal Singhji in 19th Century AD. The beautifully painted walls of Darbar Hall, the beautiful murals, portraits and antique interiors of Rajmahal Palace make it a wonderful place for shooting. ‘Lily takes a trip’, a popular fashion feature has been shot in the Rajmahal Palace in the year 2005. This scene where the model is standing on the staircase wearing a long gown hanging on steps of the stairs has been shot in this palace. Located near Palanpur in Gujarat, Balaram is surrounded by dense forest. During early 20th Century AD, it was a hunting place for Nawab of Palanpur. This hunting retreat is spread over an area of 13 acres amidst of which stands the magnificent palace surrounded by colorful flower beds. The palace architecture has the blending of classic and modern architectural style. Many Television Serials, ad films and movies have been shot at Balaram Palace that is located very close to Rajasthan border. Hindi Movie ‘Suryavanshi’ starring "Amitabh Bachchan" was shot here. The palace is now converted into a tourist resort. Located in South Gujarat, Rajpipla is an important city located in Narmada District of the state. It is one of the most preferred shooting spots for Bhojpuri and Gujarati movies. Since 1971, many Guajarati movies have been shot here. The most famous location here is the Rajvant Palace Resort which is surrounded by beautiful gardens with a river at its back. The domes, arches, pillars of various halls within this palace enhance the beauty of a scene shot here. Another important shooting place in Rajpipla is Vadia Palace which is also known as “Taj Mahal of Gujarat”. 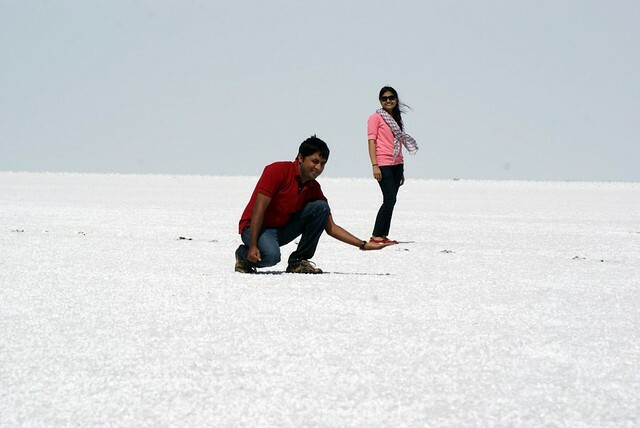 The stretch of desert with its barren look makes Little Rann of Kutch one of the most happening places for shooting. Movies, documentaries, advertisements are shot here. Advertisements of ‘MRF Tyres’, `Hero Honda Bikes’, ‘Tata Safari’, ‘Jade Blue Shirts’, ‘Deepkala Sarees’ etc have been done in the Little Rann of Kutch. Lakes located within this desert area and the ethnic villages located in the surrounding of Little Rann of Kutch are also the favorite places for shooting. Many documentaries on wildlife have been shot here which got broadcasted on National Geographic, BBC and other channels. One of the most popular heritage buildings of Gujarat, Laxmi Vilas Palace Vadodara, is a popular shooting place where many Bollywood movies have been shot. This palace built by Maharaj Sayari Rao Gaekwad, is still the residential place for the royal family of Vadodara. Hindi movies like ‘Rang Rasia’ and ‘Grand Masti’ have been shot at Laxmi Vilas Palace Vadodara. To help the film makers and others who come to Gujarat to shoot for movies, documentaries or advertisements, the government has simplified the process of getting permission to shoot in the state. Moreover the government has set up a separate Cell in coordination with the Tourism Department of Gujarat State. This Cell called “Film Shooting Cell” is set up to help the producers shoot hassle free in the state. The cell identifies and informs the producers about different shooting locations in the state and also helps them to get permission for shooting faster. The government of Gujarat is now giving Single Window Clearance for multiple permissions needed for shooting in many locations of the state. The producers can now shoot in any part of the state without any hassle and also can enjoy huge discounts (up to 25-50% in case they shoot at the properties owned by Tourism Corporation of Gujarat Limited) thereby cost for movie making is reduced. The Film Cell is planning to grant permission for shooting at the earliest within a week and maximum within a fortnight. Tamil, Telugu, Punjabi and Bhojpuri movies are also getting shot in various places of Gujarat. The songs “Dheera Dheera” I and II of Tamil Movie ‘Magadheera’ have been shot in the Runn of Kutch. ‘Gabbar Singh’, the Telugu Remake of movie ‘Dabangg’, starring “Shruti Hasan” and “Pavan Kalyan” had scenes shot in Rann of Kutch in Gujarat. Another south Indian Movie ‘Dookudu’ starring “Mahesh Babu” was shot in Little Rann of Kutch. A Punjabi Movie named ‘Love You Soniye’, debut movie of “Karanvir Bohra”, the famous TV actor, was shot at various parts of Vadodara in Gujarat. ‘Ab to Banya Sajanya Hamra’, a Bhojpuri Movie starring “Saira Banu”, was shot in Gujarat. ‘Saiyyan Chitchor’, another Bhojpuri movie is also shot in Gujarat. Due to easy policies and rules, better infrastructure and existence of many unexplored spots in Gujarat, many more movies are going to be shot in this state. I read somewhere that very old movies like Pakeeza was shot in Valsad. Is it true? thanks for the information!! can you tell me which scenes has been shot in ahmedabad of piku movie ? Hi Please read the above article, it is mentioned there. You can even watch Piku movie for finer details.